See Jane Run. See Jane FLY. 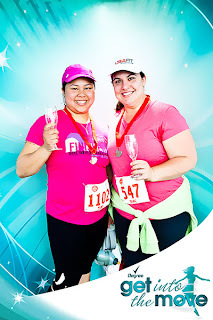 I ran my first 5k in 2002, over ten years ago, and I've run many races since then (including the SJR half in 2008), but it wasn't until 2011 that I REALLY got serious about running and training, and that had a lot to do with my best friend Rebecca - that was the year I convinced her to come run the SJR 5k with me. We like to joke around that my superpower is that I'm really good at infecting people with my enthusiasm for stuff and convincing them to do it too, and as my bestest-bestie-since-high-school, Rebecca probably gets it the worst from me. Whatever thing I'm obsessed with -hobbies, books, tv shows, etc - I inevitably get her into it too. She even wrote in our senior year yearbook, "You have enriched my life with the new experiences you pushed me (sometimes unwillingly) into." Half marathon #9 on the year, in the books. I really wasn't feeling it today. The whole time I just wanted to quit early and go back to bed. (I didn't though - I finished the whole thing. But my heart wasn't in it.) I guess we all have days like that, right? The event itself was fine - small (1500 total participants for the HM/10k/5k), well-organized, friendly. Cute medal and they covered the cost of parking for us. 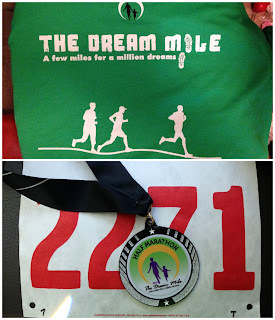 It was pretty much the exact same course as the HM I ran in March, since it was also at Hellyer County Park. Finish time: 3:03:34. Meh. I could've done better if I'd felt motivated.